“The Coventry Eagle motorcycle was born out of a cycle company formed by Messrs Hotchkiss, Mayo and Meek in 1890, selling ‘Royal Eagle’ cycles at their Hill Cross factory.” – Damien Kimberley, Coventry’s Motorcycle Heritage. While Coventry Eagle began producing motorcycles by 1901, the bulk of their output were lightweight machines, and their enduring reputation was established by several lightweight machines with pressed-steel frames during the 1930s. In the midst of the 1920s, though, several rival factories used the same engine – the JAP V-twin – to build a reputation for sporting elegance, along the lines of expensive sporting cars like Bentley and Rolls Royce. The biggest of the 1920s JAP V-twins used an ‘8 hp’ nominal rating from the Auto Cycle Club (ACU), which was the rough equivalent of 1000cc. 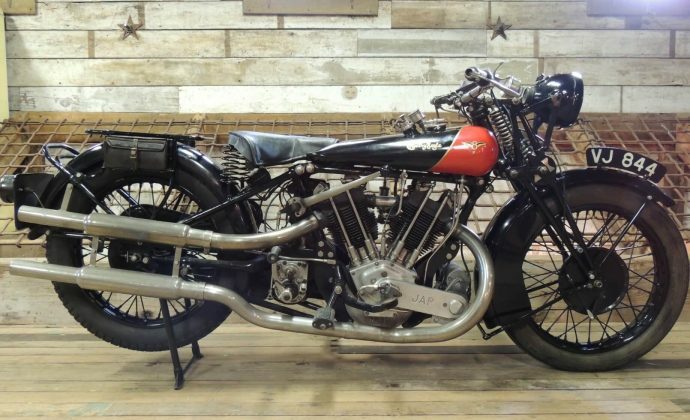 The first Coventry Eagle ‘Flying 8’ models used the JAP 4-cam sidevalve racing engine of 980cc, although the two-cam ‘sports’ engine was also used. The Flying 8 is often seen as a copycat of rival Brough Superior, as they both use big v-twin engine and bullnose saddle tanks. It’s more than likely, though, that the Brough and Coventry Eagle’s resemblance was less a matter of copying as shared ideas, for C-E’s Percy Mayo spent considerable time with George Brough during WWI, and George was no doubt already discussing the ‘superbike’ he’d build after the War was finished. The sidevalve Flying 8 was an excellent sports tourer and sidecar machine in that romantic era of the fast sidehack, and it was joined in 1926 by the new OHV JAP v-twin engine, the KTOR, which was in reality a high-strung racing engine, intended for wealthy riders capable of the regular maintenance required of a thoroughbred. To house this more powerful engine, the KTOR model had a larger-diameter frame top tube, and thicker engine plates; the Webb forks used meant the Coventry-Eagle had one great advantage over a Brough – the front brake actually worked efficiently. The OHV machine also used a Jardine three-speed gearbox, large (8″ diameter) Royal Enfield brake hugs, with the rear including a rubber cush drive. While the crimson-fronted Flying 8 was a fantastic machine, and a peer of the world’s best, the Depression meant Coventry-Eagle stopped big twin production to focus on the more popular lightweight models. 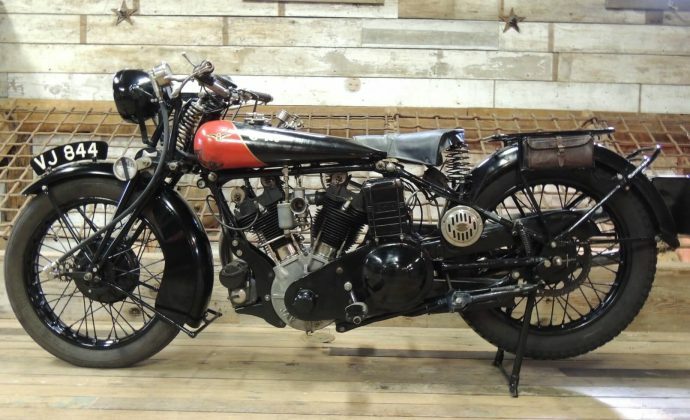 There were never many big JAP OHV v-twin-engined motorcycles on Britain’s roads of the ‘20s, yet they made an outsize impression; in truth they numbered in the hundreds in total, and the OHV Flying 8 perhaps only a dozen of these. This example was purchased from John Ellis of County Kildare by Norman Broadbridge in December 1982, than sold via Bonhams in 2011. Accompanying (copy) correspondence reveals that Mr Ellis was a wealthy collector of motorcycles who had moved to County Kildare from Yorkshire on his retirement, taking his collection with him. His ownership does not, therefore, appear in UK registration records. Previous owners, according to the accompanying old-style logbook (issued 1947) include VMCC Coventry-Eagle marque specialist, Ken Hodgson – from whom Mr Ellis purchased the machine – and motorcycling journalist/publisher, Bruce Main-Smith. Mr Broadbridge kept the machine, untouched, for many years before deciding to treat it to a cosmetic ‘tidy up’ in the early 1990s. Sadly, he passed away in 1994 before completing the work and never did get the opportunity to ride the Coventry-Eagle. Ownership then passed to Norman’s son Stephen, a VMCC Founders’ Day member. The machine was checked over by Merchant Navy Chief Engineer, Mike Sherwin in February 1994 and his list of work carried out and faults rectified comes with it. It was then returned to ‘hibernation’ and in April 2008 at Bonhams’ Stafford auction was offered for sale for the first time in 25 years following Stephen Broadbridge’s untimely death, at the age of 56, early in 2007. Lot 517, the machine was purchased by the current vendors and since acquisition has been mechanically rebuilt and kept in heated museum premises as part of their important private collection in the UK, seeing only occasional use.